Imagine getting stuck in another world. Would it be a dream come true? For 12-year-old Tim Hunter, it’s a nightmare. One shove through a magic mirror sent him into a medieval land of castles, kings, and dangerous creatures. No electricity. No running water. No McDonalds. And to make matters even worse, he’s stuck there with his (annoying) older brother and sister — Ron and Kat. They’re barely there for 30 minutes before they’re chased by a horrible, man-eating creature called a galrog and then rescued — make that arrested — by a grumpy prince named Gavril and his not-so-merry men. From there, things just go downhill. You see… there’s a prophecy about three strangers from a distant land who will defeat the evil Queen Morissa, take back the land of Tryton, and restore the throne to King Gunther. And who does the king think these three “deliverers” are? You got it — Tim, Ron, and Kat. When given the choice between fulfilling the prophecy and rotting in a dungeon — until they’re executed, that is — the three siblings are told they must steal the queen’s mirror and bring it back to the king. The queen knows they’re coming. And she uses all her power to stop them. …Does a kid with zero sword-fighting skills — and the athletic ability of a slug — have what it takes to defeat an evil queen and make it home alive? 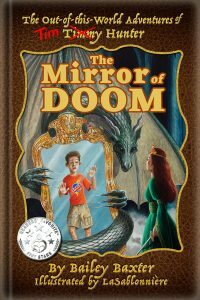 Read “The Mirror of Doom” and find out! I've always loved fairy tales. And one day, I thought, "How cool it would be if they were real!" No, I'm not a nut. Just imagine with me, for a moment, a world that exists outside our own. It has castles where evil queens consult magic mirrors… towers with long-haired damsels locked inside… and forests where hungry wolves lurk. If we could somehow enter that world from our own, what adventures could be had there! And that, my friends, was how "The Mirror of Doom" was born. Tim, Kat, and Ron came out of my own childhood. I grew up with two brothers, and the youngest was a bit like Tim. I remember that sibling relationship well. You tease each other and call each other names. But if someone else tries to mess with your siblings, you're quick to jump in and defend them. I tried to bring that dynamic into "The Mirror of Doom." The dragon gave a roar and swooped low. Erick, Gavril, and I flung ourselves down and hugged the bridge. I could feel the heat of the dragon’s flames as it flew over us. “Up!” Erick cried, yanking me to my feet as soon as the coast was clear. Trying to keep low, I scrambled after Erick like my life depended on it. Which, of course, it did. But I didn’t get more than just a few steps before I had to flatten myself on the bridge again. This time, I swear the dragon cranked the heat up a notch. Clouds of sulfurous smoke surrounded us, making me choke. He grabbed my arm and hauled me to the end of the bridge. Gavril was right on my heels. Unfortunately, so was the dragon. Free preview of first two chapters of "The Mirror of Doom"